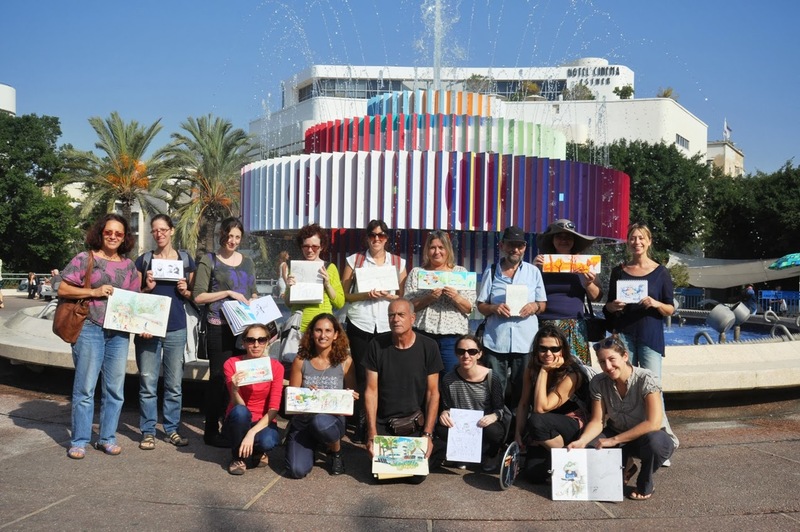 Dizengoff Square, one of the icons of Tel Aviv, was our meeting point for the last Sketchcrawl. It'is challenging for me to transform the feeling of such an iconic place, that was drawn and photographed so many times, without falling into "postcard view". I got up back to the square, and sketched this very urban view down to the streets. I used last minutes capturing people at square. This sketchcrawl was especially fun - the place, the weather, and the most important - the company. It is always exciting to see at the end all these different approaches and points of view of the same place! תודה, חגית! תצטרפי אלינו בפעם הבאה!